Calculate your fake Twitter followers? Twitter plays a very good role in Social Media, especially when it comes to interact with the open world. Facebook has a close reach to your fans or the community of users of the same interest. Twitter has a wide reach when it comes to get a Google search because search engines fetch your status updates and show them as real-time updates. Since your status update is current it has to accurate. Related Post: Easy way to increase your Twitter Followers. When it comes to the credit score on Twitter, many of us judge Twitter users on the basis of the followers. The follower has a unique taste of following you and that might be any reason which they may find interesting in you, which end up in following you. StatusPeople is a social media branding tool, which helps you to check the status of the Twitter users. Once you authenticate the application with your Twitter account you can know the status of your Twitter followers. 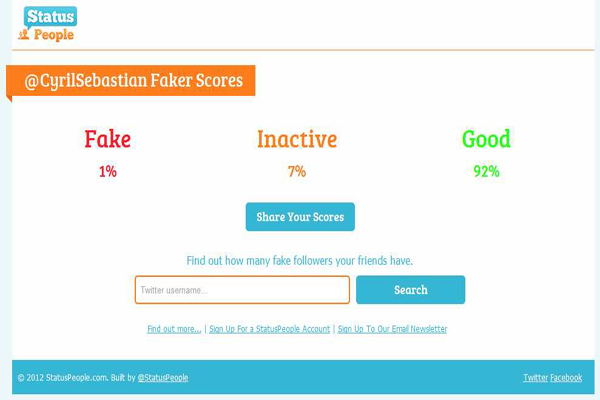 Twitter followers are categorised in three groups that is Fake, Inactive and Good. This tool helps you to get your Twitter credibility status. Related Post: How to use Facebook Page for your Business? This tool is very useful when you are working in the field of Social Media, Online reputation management, branding, social networking, social sharing and most important when you spend most of the time in handling the online users on Twitter. Many of the brands or users prefer to buy their followers and increase their credibility in less time. But there may be less interaction among the other clients or users which may end up into a dormant account. From this Twitter application you can easily spot out Fake followers. This application claims to get accurate stats if you have till 10000 followers. For example, when you check my profile status you will find the fake status for is 1%, inactive followers are 7%, and overall status of my Twitter profile is good which comes to around 92%. My Twitter ID is @CyrilSebastian, feel free to test it. Let me know the score of your Twitter profile. « How to take a backup of your Photographs from Flickr account?